Epic Games has fixed a Fortnite exploit that let players fire over cover without being seen. Few things can be more frustrating in a Battle Royale match than being downed by opponents you couldn’t possibly see. Thankfully in Fortnite’s case, Epic Games is trying to address the problem of “ghost peeking”. As described by designer Nick Donaldson in a Reddit post, ghost peeking is an exploit that lets you fire from cover without being seen. In short, when a player crouches uphill they can sometimes shoot over the hill without being spotted by targets. 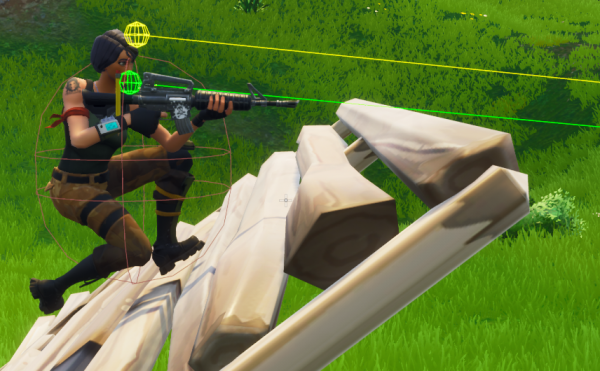 The reason for this is because Fortnite’s animation system makes adjustments to ensure feet are correctly positioned on slopes. In some cases, this can lower the character mesh even when your relative position hasn’t changed. Thankfully, one of the fixes in the latest patch addresses this exploit to ensure your head is still visible. Of course, that won’t protect you from the new sniper rifle that fires through walls. You can’t avoid every danger in this game after all!